What: (HERE IS THE FULL STA.SH OF TESTIMONIALS) Starting with my account, in December of 2016 Spoder opened up holiday customs for their closed-species, Skulleids. 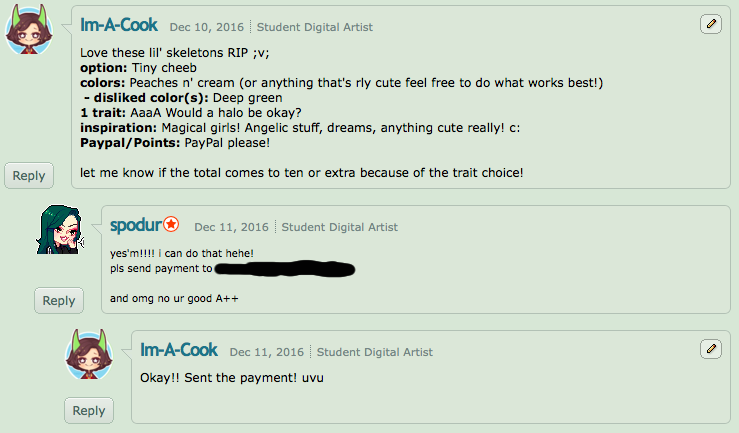 I bought one for 10USD and commented my custom ideas, sending her payment shortly after she sent me her PayPal. Soon afterwards, on December 15th, Spoder made an announcement along with a set of adoptables that their tablet had broken and they were looking to buy a new one, advising us to be patient as they'd get those customs done as soon as possible. Another update came on January 5th, 2017 that their tablet was broken for good and that progress would be slow. As someone who has had their fair share of finicky tablets, I figured everything would be fine and that they'd eventually deliver. Besides the fact that it was still too early for them to feasibly finished the customs with the amount of orders they currently had. On January 26th of that year, Spoder updated again with good news: They'd gotten their hands on a cintiq and could now resume progress, eager to see my custom I decided on waiting to message them and eventually the custom fell out of my mind. Time passed until September 26th with Spoder posting a few submissions of art with no mention of working on owed customs. They also made two different adoptable sets still without providing updates on owed holiday customs as seen here & here. September 26th is the last update they made before going dark until January of 2018. At this point, I hadn't messaged them because I didn't want to pressure them, and understood they were going through a lot of hard times. Nonetheless I was excited to see progress but heard nothing and have still heard nothing despite sending them a note which they read on Deviantart. At this point in time I would like to be either refunded or receive a MYO slot so I can finish this custom myself, but I have been unable to make contact with Spoder as I don't have an instagram, where they're most active. EDIT (9/10/18): As of today Spodur has sent me the work due! I will be contacting the others mentioned on this post to check on whether or not they have received their work. ANONYMOUS TESTIMONIAL: I started to reach out to other buyers who didn't receive their finished products and got in touch with a few who's accounts I'll detail below. This individual however wished to remain anonymous. curryspice TESTIMONIAL (RESOLVED): curryspice TH/ Cvrryspice @ DA was one of the others I reached out to (They did agree to share their identity hfnghjl I just forgot to crop my part out!!) They ordered one mystery aesthetic adopt and another custom from Spoder which they never received. Their notes to Spoder can be found here. 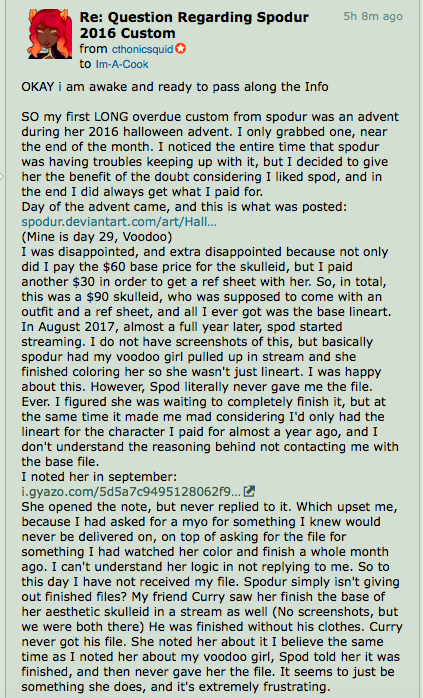 Below is their account of Spoder's behavior. AS OF 12/10, CVRRYSPICE HAS RECEIVED ALL OWED ARTWORK. 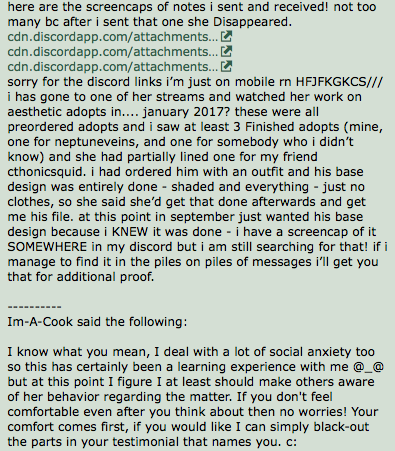 @ASHME TESTIMONIAL (RESOLVED): TH user @Ashme / Princeasmodai on DA has also not received work they paid for from Spoder, including a holiday Skulleid and the transparent for a adoptable lines set. They have sent multiple messages to Spoder on Instagram, where they go by MilkyMelty, only to receive promises of finishing the work and no follow-up. (EDIT 6/14/18): @Ashme received both of the transparent for the customs they ordered and they've reached an agreement with Spoder. 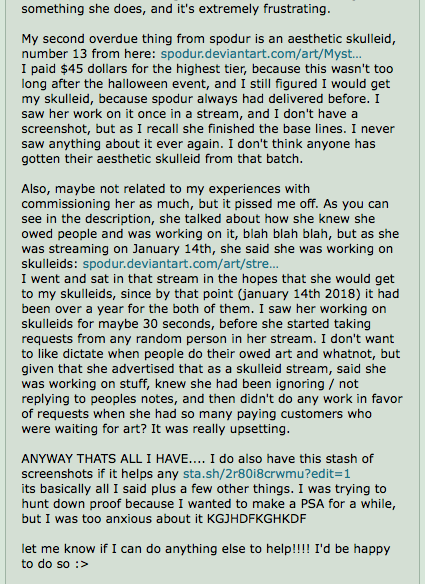 cthonicsquid TESTIMONIAL: User cthonicsquid at TH/DA has also not received owed art including a custom costing them 90USD, and another Skulleid costing 45USD. They have multiple screenshots of their PoP and evidence that Spoder read the note sent to them regarding custom process. As of this writing, all the buyers mentioned in this PSA have not received anything! 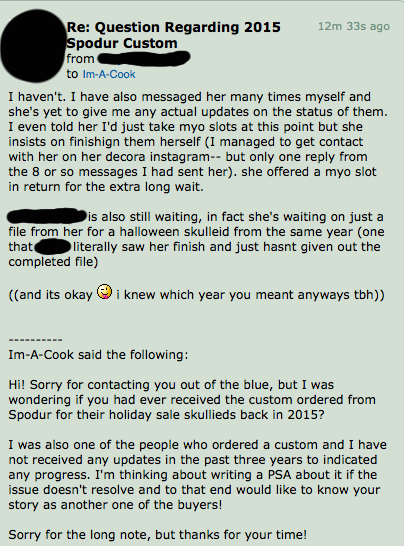 IN CONCLUSION: Spoder has willing opted to not inform the buyers who are still waiting for their customs. There are many other buyers other then the ones here who are going through similar issues with Spoder and their business. I would not recommend purchasing anything from this user until they sort this out. If more people come forward with their accounts, I will be happy to add them to this PSA. As mentioned earlier, most of us would appreciate a refund at this point. I will be looking to post this on my DA and potentially Artist Beware, the Artist Beware will be added and linked when it goes up. Thanks for reading! EDIT (6/14/18): Blacked-out Spoder's full name and email for artist protection. Apologies for not doing that when I initially posted. Will be submitting the artist beware today. HERE IS THE POSTED ARTIST-BEWARE. EDIT (6/15/18): @Spoder has reached out and communicated that they will be working on the orders and sending them out asap, so hopefully I will able to mark this as resolved soon! They are looking to finish things near the end of the summer. EDIT (7/7/18): As of writing both myself and other individuals affected by Spodur have not received any updates regarding owed work. See recent update. EDIT (7/9/18): Spodur has posted a journal regarding their absence and has directed affected individuals to comment with what Spodur owes them and if they would like to have the owed work finished or refunded. IF SPODUR OWES YOU WORK, PLEASE COMMENT ON THE JOURNAL LINKED HERE. Thanks for letting me know! I’ll add them to the PSA shortly. Am also waiting for a $25 aesthetic skulleid (November 2016). I never messaged spodur because they had written on their profile not to message them to ask, because it stressed them out. Zarkadi I'm sorry to hear that! Yeah a lot of us held off because we didn't want to overwhelm them but after two years? There needs to be some kind of update. Thanks for sharing your story!